Unlike spoken language, writing and graphic systems are dynamic, imaginative means for communicating ideas visually. Works of art---ffective vehicles in their own right for conveying meaning--gain visual and communicative strength when they include writing or graphic symbols. Moreover, inscription itself is a powerful, creative act. 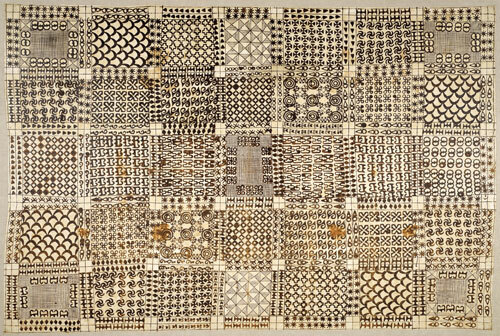 In different African social, political and cultural contexts, works of art often incorporate scripts as one way to express how power is accrued through the acquisition of specialized knowledge and skills, such as healing with herbal medicines, communicating with the spirit world and writing. This in turn is frequently linked to the potential for social, political and economic gain and to assertions of legitimacy and control. Over the centuries, Africans have developed their own writing systems or adapted existing scripts to document and represent their cultures and histories. 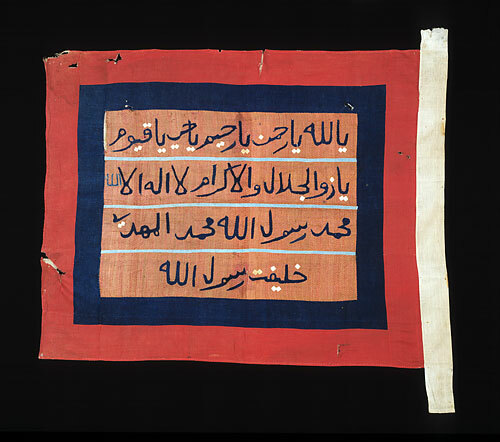 In creating works of art that serve those who guard and exercise power, such as warriors, leaders and members of religious or political associations, artists rely on the symbolic significance of specific materials, images, performance contexts and, at times, inscriptions to imbue objects with greater efficacy and visual potency. 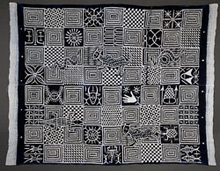 Used in contexts of power and prestige by the Asante and other Akan peoples of Ghana, the graphic system adinkra bridges the verbal and the visual. Adinkra symbols figure on wooden prestige objects, jewelry, brass weights and, most prominently, as stamped designs on cloth. Asante king Agyeman Prempeh I (ruled circa1888-1931) wore this cloth to the meeting with the British at which he was deposed in January 1896. King Prempeh was sent into exile but returned to Ghana in 1924, where he ruled as chief of the capital city of Kumasi until his death in 1931. The Nigerian ideographic script nsibidi was developed by the Ejagham peoples, but its use now extends to their neighbors, the Igbo and Ibibio. Nsibidi encodes secret knowledge that is not readily accessible to outsiders. 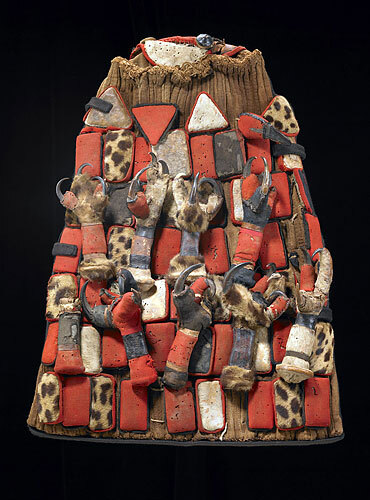 Its power is linked in part to the public display of masks and textiles embellished with nsibidi that people see but might not understand. Nsibidi signs feature prominently in the striking blue-and-white ukara cloths that high-ranking men wear as wrappers or display as backdrops for ceremonial occasions. Designs typically combine power symbols, such as the python, crocodile or leopard-its spotted pelt is sometimes depicted as a checkerboard pattern-with more cryptic linear nsibidi signs that refer to human situations-love, marriage, divorce, disagreement, illness, trade or enslavement. 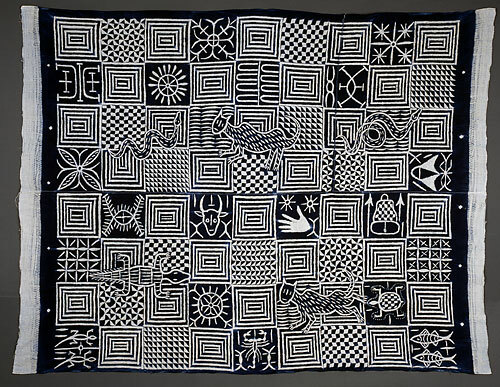 Taken together, the motifs suggest the control that men's associations exert over social, economic and political matters, although the precise meaning of any particular cloth might be known only to its maker and a few others in the highest ranks of the association. O God! O Merciful! O Compassionate! O Living! O Unchanging! and Muhammad is the Prophet of God. Muhammad the Mahdi is the representative of the Prophet of God. 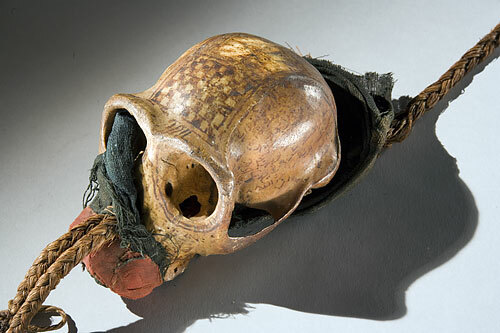 The Arabic script and mystical square inscribed on this chimpanzee skull added meaning and power to an already potent object. It seems to combine the powers of Islam and the written word with those of the wilderness, and it likely functioned as a sign of the specialized knowledge and skill possessed by an influential ritual specialist. Symbols associated with the wilderness and with Islam enliven the attire of a high-ranking Loma warrior. 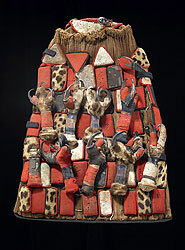 Items from the wild include leopard fur and, on the hat, the talons of the crowned eagle, a bird of prey. 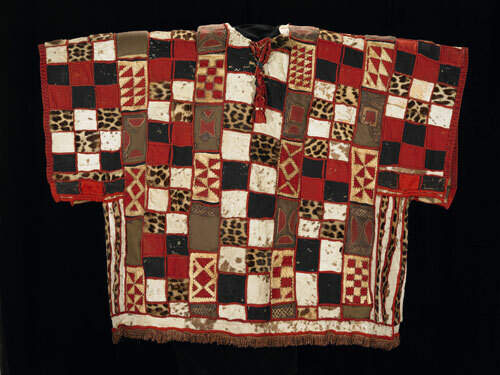 The red fabric relates to the knowledge of ritual specialists, and the checkerboard pattern of the appliquéd tunic suggests the geometric format of an Islamic talisman, the mystical square. 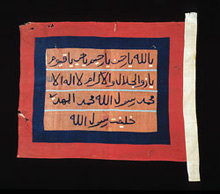 Leather-covered amulets on the hat contain folded pieces of paper inscribed in Arabic with passages from the Qur'an and convey God's protective powers to the wearer.